I'm all for good oral hygiene. My family and I have a pretty regular routine as far as brushing our teeth, flossing, and using a mouth wash at least twice a day. We also switch out our toothbrushes every three months or any time we have any kind of throat infection or get sick. What I've actually always wanted is something like this product but I had no idea where to get one before. This device is very easy to use. It runs off of a few AAA batteries. All you have to do is stick your toothbrush each time after you use it and it only takes a few minutes to sterilize your brush. Not all toothbrushes fit perfectly in the little grips inside, but you can still adjust your toothbrush so that it sits well in front of the mini UV lamp for sterilization. 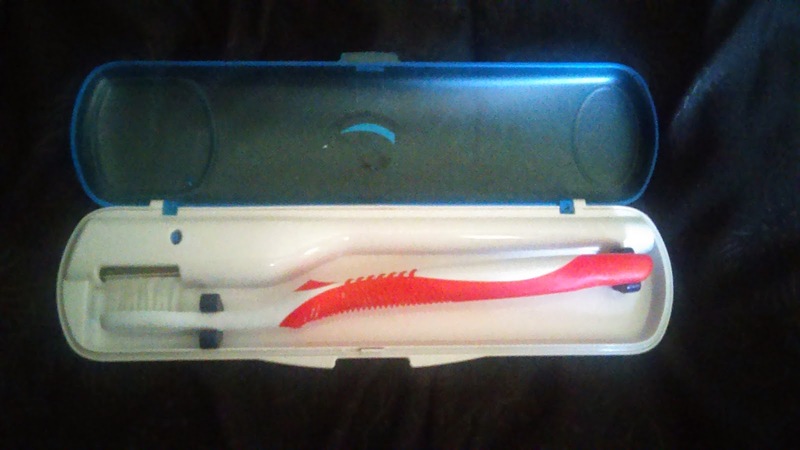 I'm able to use it with adult and children's sized toothbrushes. I'm happy knowing that the mini UV lamp inside is killing all kinds of bacteria that may be lingering on our brushes. It's a great size- yes, very portable. I can stick it in my bag to take on vacation with us. My only suggestion is that I think there should be an on and off switch, rather than it just turning on when it is shut, since there is not always a toothbrush inside and the battery is slowly being drained. You can purchase this Toothbrush Sanitizer on Amazon.